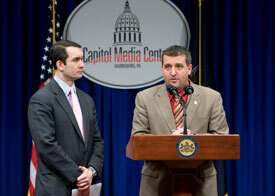 Rep. Frank Farry (R-Bucks) and Rep. Eugene DePasquale (D-York) introduced legislation creating a voluntary, online database to help emergency personnel and law enforcement officers access an individual’s emergency contact information at a bipartisan press conference held in Harrisburg on Feb. 14. HARRISBURG — Coinciding with National Organ Donor Day, State Rep. Frank Farry (R-Bucks) and Rep. Eugene DePasquale (D-York) unveiled legislation that would create a voluntary, online ‘Next of Kin’ database to help emergency personnel and law enforcement officers access an individual’s emergency contact information. House Bill 2098 would create an online ‘Next of Kin’ database, allowing individuals to voluntarily submit up to three emergency contacts and/or vital medical information. The bill was the subject of a joint bipartisan press conference held by the lawmakers this morning in Harrisburg. “This database, which would be modeled after a similar program in Ohio, would allow only emergency personnel and law enforcement officers to access the information in emergency situations by swiping the individual’s driver’s license or identification card,” said Farry. Farry also noted that the records within the database could be changed or removed at any time by the individual. DePasquale and Farry both noted that the information in the database would not be public record and would be used in the event of an accident where the individual is unconscious or unable to communicate. Other states with a similar program include: Colorado, Delaware, Florida, Illinois, Maryland, and South Carolina.